Jorien Ter Mors of the Netherlands leads Arianna Fontana of Italy at the European championships for short track. After an uneventful, but controversial day off (which is why we went straight from Day 6 to Day 8), where Team USA’s speed suits were implicated in their so far poor performance. They went so far as to change back to their old suits, but it was to no avail. We were treated to surprises very early on when Jan Blokhuijsen stepped up to the line in pair 2, having gained a start in the 1500m when Sven Kramer pulled out. He set a time which was a great deal faster than anyone who was near him in the starting order, and it wasn’t until pair 7 when gold medallist from the 1000m, Stefan Groothuis slipped under his time. It seemed to be deja vu when Mark Tuitert, defending Olympic champion took the lead, but it was dashed when former world record holder Denny Morrison slipped under his time. Then in pair 17, just when we thought Shani might redeem himself, now that he was wearing the old suit, Zbigniew Brodka of Poland flew past him in the last corner to take the lead. With one pair to go, my pick for the win, Yuskov only managed to get into third, leaving Brodka with a guaranteed medal. Then the final pair came, and Koen Verweij stunned us all with a brilliant finish to post the exact same time on the board. For what seemed like an eternity, Brodka and Verweij looked up at the screen waiting with their hearts in their mouths for the timing officials to go to the thousandth of a second, the result – Brodka 1:45.006, Verweij 1:45.009. Taking the bronze was Canadian Denny Morrison, completing his collection of Olympic medals – he now has a gold (Vancouver, team pursuit), a silver (1000m), and a bronze, with positions 1 to 11 finishing within a second of each other. Predicting the men’s 1500m was difficult, but thankfully doing so for the ladies’ race is significantly simpler. There are favourites such as Ireen Wüst, who has already snagged a gold and a silver medal from these games in distances either side of the 1500, and who is current Olympic champion, and there are a number (a much smaller number than in the men’s race) of skaters who are realistic challengers. There is also a very real chance that the Dutch might once again claim all positions on the podium, as they seem to be skating very well at the moment. Lotte Van Beek, who finished just outside of the medals in the 1000m, is stronger in the 1500m and was second behind Wüst at world championships last year, and has been skating very well in the lead up to these games. Jorien Ter Mors (pictured) who is only the second athlete ever to compete in both short track and long track at the same games will be a credible threat, especially since she is Dutch champion in this distance. Incidentally she also came second at Dutch championships in the 3k, but did not race it in the Olympics because she prioritised short track. In a similar vein, her performance may not be optimal, since she came fourth in the ladies 1500m on short track earlier today and may not be fully-recovered from a full day’s short track racing. How is it that the Dutch have become so dominant? Well, if you look back on the history of speed skating, this is nothing new. The Dutch are mad about skating, and I’d wager that the majority of the world speed skating population is Dutch. Most other countries, even countries you might perceive as “big” skating countries, have relatively small programs when it comes to speed skating. The Dutch program encompasses the better part of the entire population of the Netherlands (about 18 million). Their program is not known for being the most innovative one in the world, and many a dutch coach will say strange things like “the sport hasn’t changed in the last 30 years and everything we need to know about it is known”, but the results are undeniable. 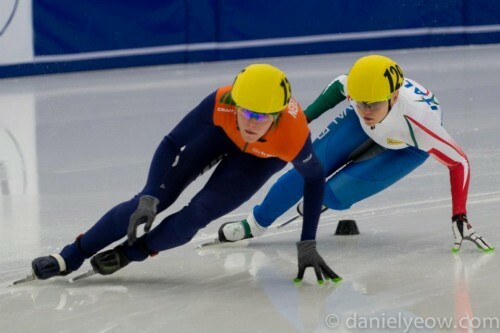 Having lived in Holland, I can attest to the fact that the sport of speed skating is a huge part of their culture. In the winter, if it is cold enough for the canals to freeze over, everyone goes nuts for outdoor skating. To me, this seems silly, because the Netherlands is home to a large number of some of the best indoor ice facilities to be found anywhere in the world, which is a big reason for why I was living there. But you can’t get away from your culture. The romanticised image of skaters making their way along frozen canals, with a windmill in the background is branded strongly into the psyches of you dutchies growing up. The “Elfstedentocht” (literally “eleven cities tour”) is a race that happens whenever the ice is thick enough over the length of the course that spans eleven Frisian cities. The last time this happened was in 1997, before that twice in the late 80s, and before that, the famous “hell of 1963” where a storm blew in from the north and forced almost everyone to stop (and actually killed a few people too). The surprising thing is that if you ask dutch speed skaters if they would rather win an Olympic gold medal or the Elfstedentocht, most would reply the Elfstedentocht without hesitation. The system relies on numbers, and when almost everyone in the country speed skates at some point in their lives, you’re always going to get a few good ones. I used to think that this was an enormous waste of talent, but on further consideration they do it like this because they haven’t got much choice – dedicated talent development for such a large number of people is prohibitively expensive, so just letting skaters figure it out themselves, and then throwing them into races to filter out the good ones isn’t such a bad strategy (but it just kills me to think about how many exceptional skaters have probably never made it high enough in the system to be spotted by a good coach). Good skaters are then nurtured through their regional teams, and if they perform very well, then they are selected to the dutch junior development program, dubbed “Jong Oranje” (young orange – football fans, speed skating fans, and anyone who has ever been in holland on April 30 will know the significant of the colour Orange to the dutch). They train and race under the guidance of this program and are basically already full-time athletes, until they come of age (in speed skating, you are a junior until your 20th birthday, but you’d better hope that your birthday falls before July 1st, because that’s the cutoff date for the age categories). Once they become ‘senior’ skaters, then they will ordinarily go on to join a commercial team. Famous Dutch skater Rintje Ritsma was responsible for the formation of this part of the system, because he felt that the Dutch could not be competitive with countries such as the USSR and East Germany (which both had massive state-run sporting programs at the time) unless they either spent a lot more on it, or brought in a large amount of private sponsorship to what had been until then an ‘amateur’ sport. This is economically viable in holland because a speed skating event such as dutch nationals will basically take up three full days of TV programming, and one can expect most of the dutch population to watch it. Some of the top teams have budgets in the tens of millions of Euros, while smaller teams can barely afford physios. However such is the size of speed skating in holland that a skater, even on the smaller teams, can expect a small salary, skating equipment, suits (those things are expensive), a lease car, a really nice road bike, and all facilities, ice time, and physio visits are paid for. The system is not without its flaws of course. There are politics, and occasionally a sponsor will suddenly disappear (DSB Bank went under in 2009 and left a whole team, as well as many international skaters with personal sponsorship arrangements, high and dry). There are, however, two recent extra factors which have added to the strength of the team, and they are short track speed skating, and inline speed skating. The dutch have steadily improved their position in world standings in inline speed skating, and likewise with short track speed skating. This can mostly be attributed to new foreign coaches being brought in to revitalise these programs in sports that the dutch have previously not cared so much about. These coaches have brought new and innovative training methodology and new knowledge into the mix, and athletes who have been in a position to do two sports, have been able to take advantage of this. Michel Mulder for example has won world titles in inline speed skating, and Jorien Ter Mors has been European champion on the short track. Having people come in from different sports and winning in as big, and established a sport as long track in the Netherlands also has the effect of forcing the established players to up their game, and so this goes some of the way to explaining the current dominance. Don’t forget to click on the sochi2104 tag below to read other articles about these olympics. You may also want to read the ‘Sochi Specials’ of which there are now three – concerning the speed suits that the skaters wear, the difference between long track and short track, and where I explain that it is NOT about the suits. Any feedback or suggestions for questions to answer or things to write about are welcome.